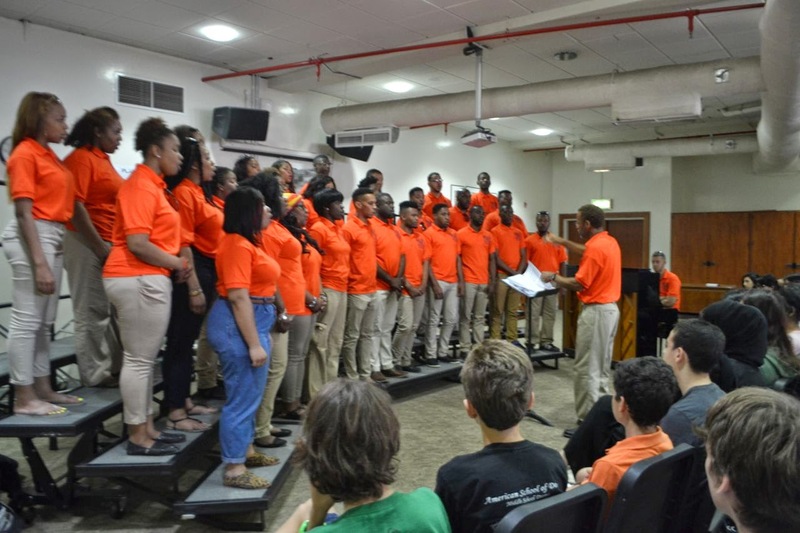 AfriClassical: Eric Conway: First Days in Morgan State University Middle East Tour - All is Well! 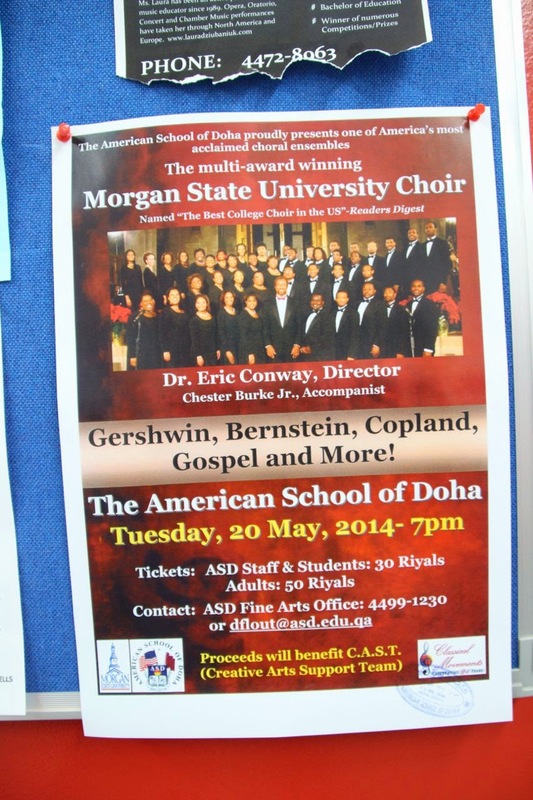 Eric Conway: First Days in Morgan State University Middle East Tour - All is Well! The Morgan State University Choir left Washington Dulles airport 10:15 on Sunday, May 18, 2014. 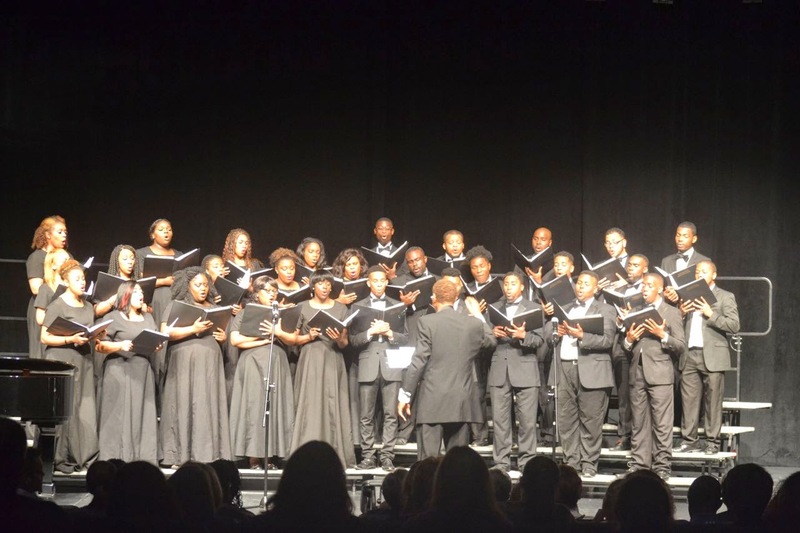 Once again, the choir left Baltimore, one day after 2014 Commencement Ceremonies, where Eric Holder, the current US Attorney General, spoke for our special ceremony dedicated to the 60th anniversary of the Brown vs. Board of Education Decision. Three of the choir members on this tour, graduated from Morgan on Saturday, which makes this a wonderful graduation present! We arrived to the airport early enough that we could leisurely go to the gate of departure. The flight time was appr. 12 1/2 hours from Washington Dulles which spanned seven time zones. Qatar Airways proved to be a very fine airline. Most traveled well on the plane. Most slept during the flight. Upon arrival, no one's luggage was lost, unlike in previous tours. After a brief period going clearing customs as well as purchasing visas for Qatar and our next destination Oman, we were on way to our hotel, the Kingsgate hotel in downtown Doha. After check-in the everyone in group ate in the hotel restaurant for a buffet meal which was quite tasty, well-prepared in a Qatrian manner. 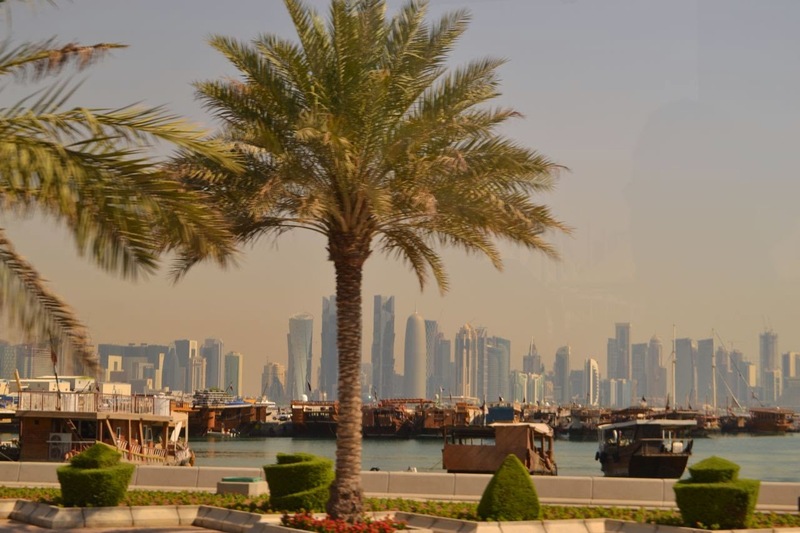 Doha is the capital city in the country of Qatar. Per our guide Hari from Nepal, Doha has approximately 1.2 million people in this city, in a country of 2.1 million, obviously the largest city in Qatar. One will note the architecture in most of the city is a very light sand color, by design, so that after strong sand storms, the buildings will not have to cleaned. This morning, we had a early departure at 8AM. Our first stop was to go to the camel race track! 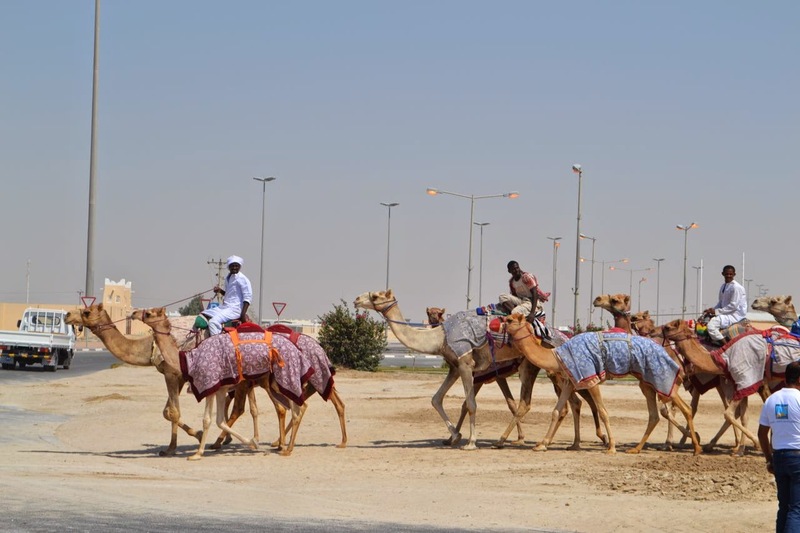 Although races were not held that early in the morning, we were able to capture some trainers walking their camels. 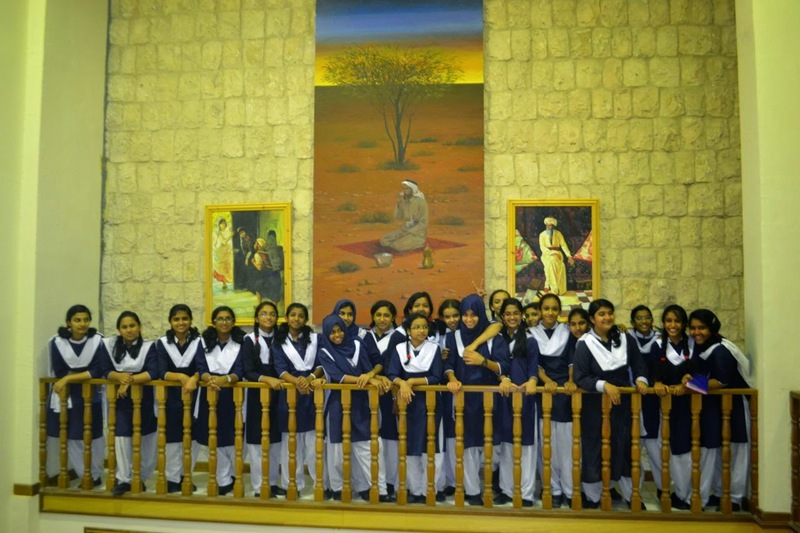 We then visited the Sheikh Faisal museum, which was a private collection by the grandson of one of the founders of Qatar. He is a very successful businessman who began collecting items in the 1960's. His collection is regarding as the 2nd most popular attraction in Doha. 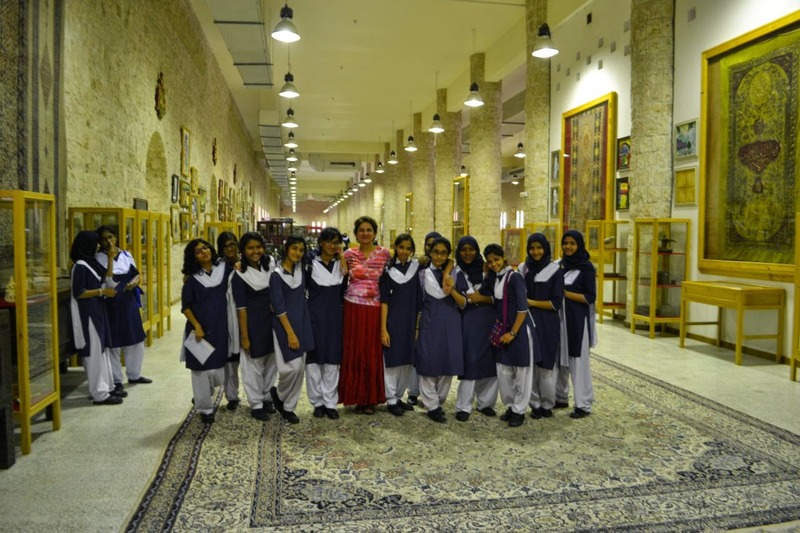 After the museum, we gave a workshop at the American School of Doha. This was a very appreciative group who enjoyed a short demonstration and question and answer period to engage their students and encourage the students to return to the school for our 7PM concert. Our presentation was at the end of their school day 11:30-12:30. In Qatar, all activity shuts down from 1- 4 as this is the warmest part of the day. After 4PM businesses will re-open and return to work. The school closed a 12:30 PM. After the school, group went to one of the largest malls in Doha for lunch, Villago Shopping Center. This was a very beautiful mall, with an stream with gondola on hand for anyone who wanted to ride. After the mall, the group returned to the hotel to change into concert attire for our 7PM concert at the school. Our first concert went very well, and was very well received. Due to security restrictions of the school, this concert could not be advertised in the typical media outlets, and only advertised via word of mouth. Consequently, the number who attended was not very large with only a couple hundred in attendance, however, they were very appreciative. See various photos attached from our first two days of out tour to last through the 30th of May. We will next visit the country of Oman after Qatar, and finally the United Arab Emirates - namely Dubai, the most famous Emirate. Tomorrow, will be one of the only days without a concert, as we will get to experience Doha in all its glory!